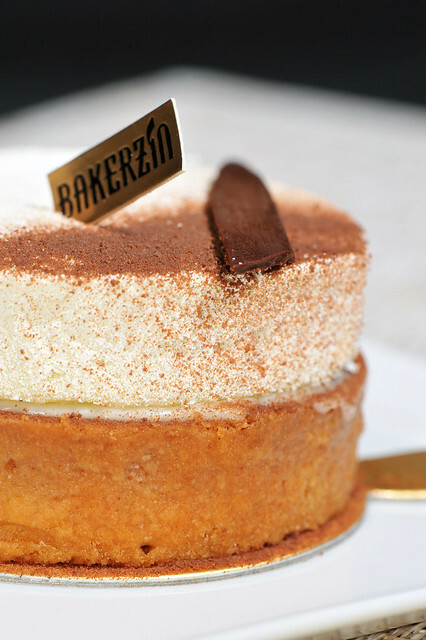 Bakerzin launched four new tarts a couple of weeks ago but they most certainly beared resemblance to some of the familiar favorites we know. 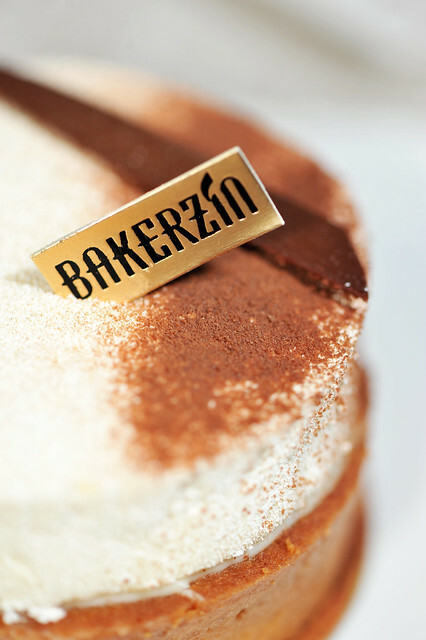 Utilising some Bakerzin dining vouchers we had, we’d got some for a sampling. (1) Mango Madness, as the name implies is supposedly packed with tropical goodness. Or at least we had hoped it to be so. Pâte sucrée was quite crisp and of acceptable thickness. 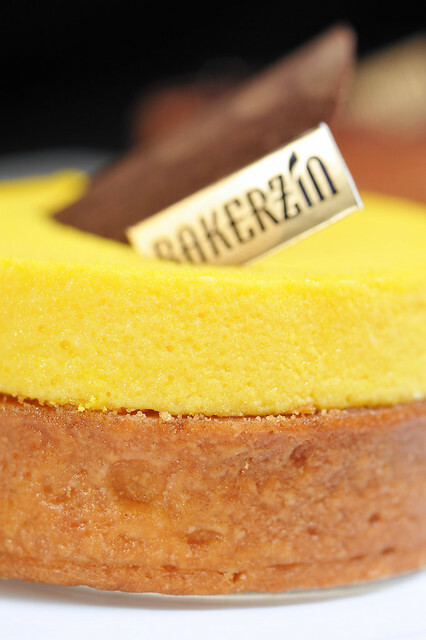 It is layered with mango gelée as well as a vanilla ganache, separating the mango mousse by a layer of sponge soaked in lemon syrup. 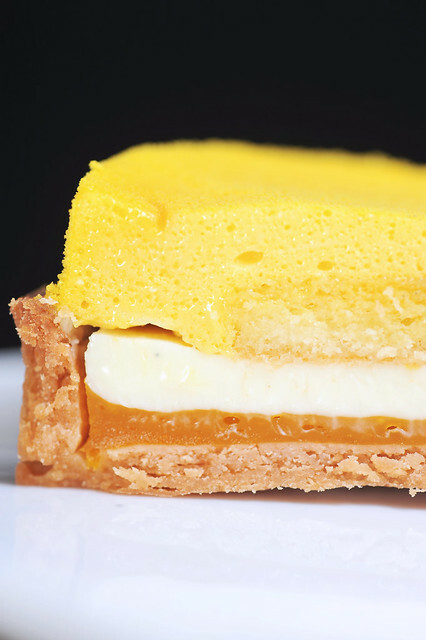 In spite of the alluring name, the tart’s “mangonosity” is far from the intended level of “madness”. In fact, it is a “mere mild” at best. Perhaps I had some pre-conceived expectations on how a mango tart should taste like, having made Sugino’s Tahiti earlier. 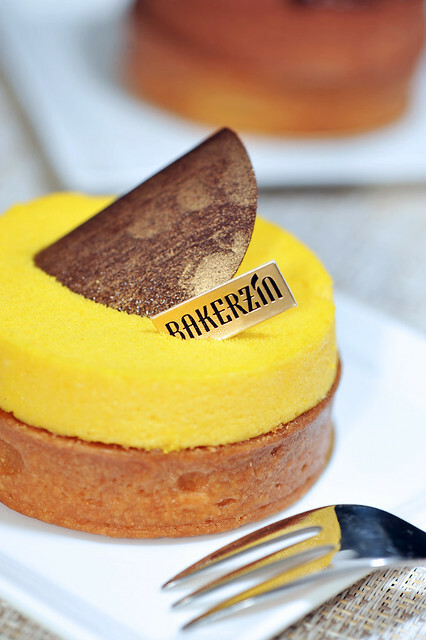 In my humble opinion, Bakerzin needs to put in more work on this tart to justify the rather hefty pricetag of $7.80+ for a takeaway. 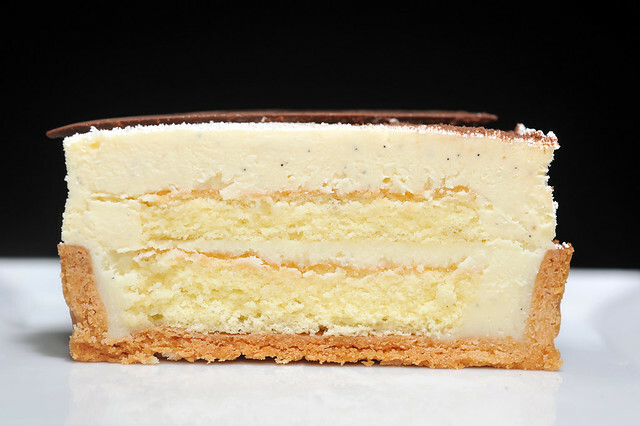 (2) Vanilla Heaven, with layers of vanilla ganache and vanilla cream separated by slabs of sponge soaked in vanilla rum syrup. This tart is reminiscent of Pierre Herme’s Tarte Infinitement Vanille (TIV) and most definitely tried to mimic the famous tart in taste. We had mixed feelings about this quite literally as J liked it a lot while it was too sweet for me. It reminded me of a childhood Rabbit brand milk candy 大白兔奶糖 which was caught in the melamine saga a few years back. The creamy texture and flavours from vanilla are its plus points but its sweetness probably tipped the Brix scale. 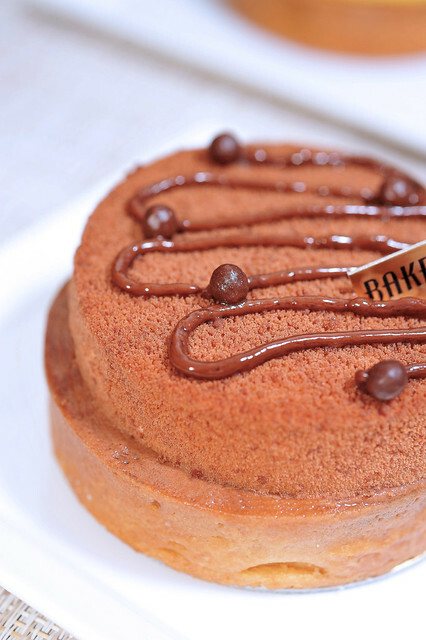 Its a bold attempt to remake a dessert as famous as TIV but Bakerzin is definitely not new to this as their “Sweet Pleasure” is really PH’s “Plasir Sucré“. Unfortunately, Vanilla Heaven looks like TIV but most certainly does not taste like it. 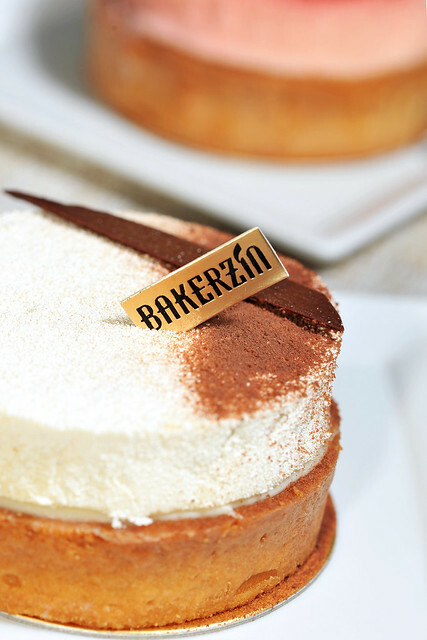 PH used marscapone cheese in the top layer only to be changed by Bakerzin to vanilla cream. I would have preferred the slightly tart taste from marscapone cutting through all that sweetness thus making it more interesting. It would otherwise be nothing but sweet, making the tart somewhat one-dimensional. For me, that is simply not enough in a tart that aspires to be a great, if not the greatest one ever made. “Heart of Rose” has a similar composition to “Mango Madness” with everything mango replaced with rose or raspberry. 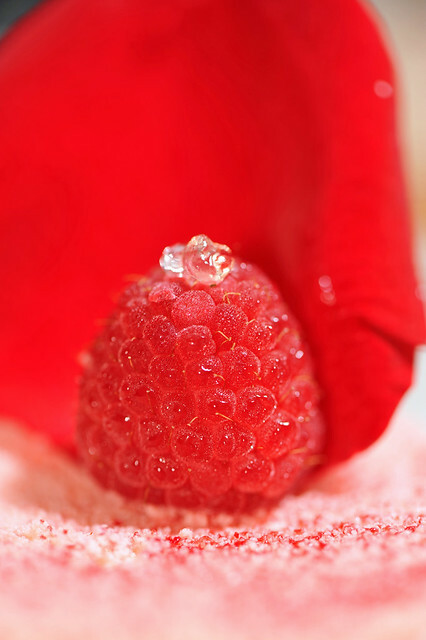 Framboise gelée over pâte sucrée, layer of sponge topped with la crème aux petals de roses. 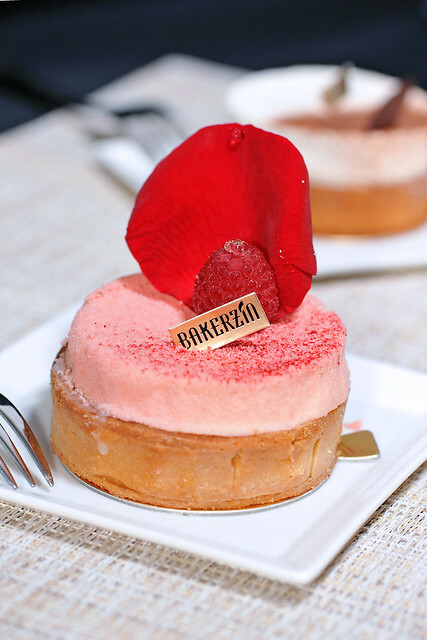 Embellished with a fresh rose petal and raspberry donned with droplets of glucose, it doesnt take much to tell that Chef Daniel Tay drew heavily from Pierre Herme’s Ispahan in creating this tart. 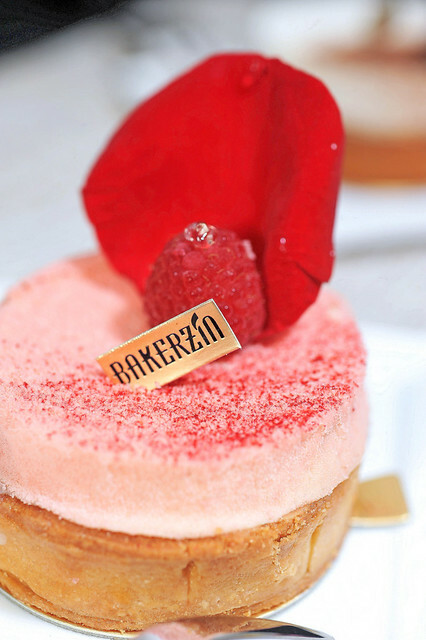 Having re-created PH’s similarly themed “Tarte Ispahan” just a couple of months ago, it was instinctive for me to compare Bakerzin’s version to the original PH’s. Truth be told, I’d liked “Heart of Rose” a tad more than Tarte Ispahan; the latter was too “hard-handed” for me in taste owing to the heft from the creme frangipane in it. 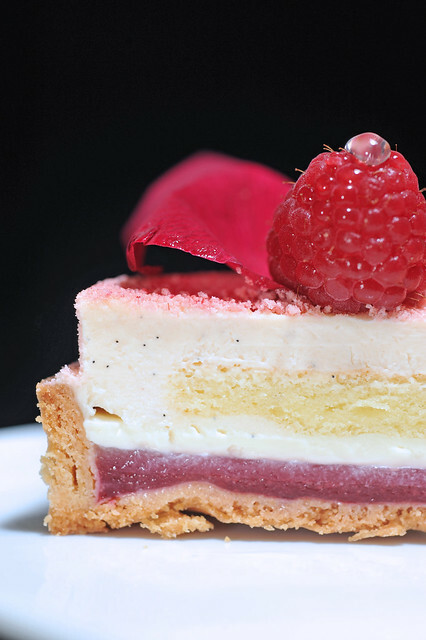 The rose-infused cream in “Heart of Rose” in contrast, was gentler and more refreshing to the palate. However it is not without its quirks. This much sound like an oxymoron but the gelée layer probably had too much gelatine in it, creating an almost harden agar-like consistency . To me, it would have been better if the textures were softer, probably adhering to the hues of feminity this tart portrays. It is otherwise to me a more successful rendition, compared to Mango Madness. Sumatra Supreme, smooth Valrhona dark chocolate mousse embellished with “perles craquantes” not only on the surface but also within the tart itself, chocolate sponge soaked in coffee infused syrup and then topped with white chocolate mousse infused with sumatran coffee. 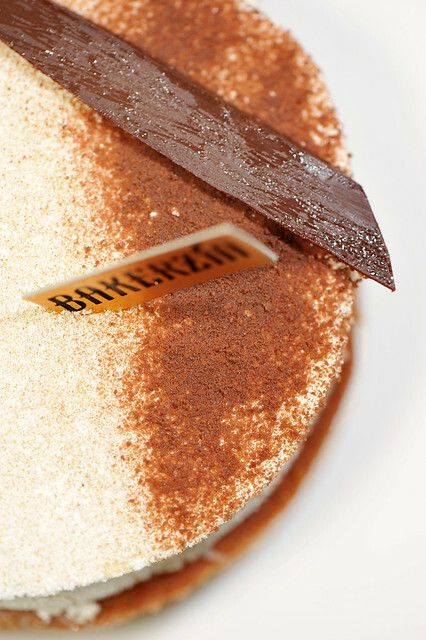 Simply put, this is the Tiramisu in tart form. For me, this is the most satisfying of the four tarts. That said, its quite difficult to go too wrong with anything using valrhona chocolate. The dark chocolate ganache should appease any dark chocolate lover while the coffee provides some boost in aroma and flavour in a subtle yet discernible manner, playing second fiddle to the chocolate. While the craquant pearls add crunch and thus textural sensation, the ganache could have been smoother, perhaps with better control during tempering or more balanced use of cream and/or butter. Some cross-sectional shots of the 4 tarts revealing their innards. And please please please do something about these somewhat tacky and bewildering sounding names. It sounded nothing but like bad publicity! This entry was posted on December 3, 2011 by Alan (travellingfoodies). It was filed under Food and was tagged with Bakerzin, framboise, heart of rose, Ispahan, mango, mango madness, perles craquantes, Pierre Hermé, raspberry, rose syrup, sumatra supreme, sumatran coffee, tarte infinitement vanille, Tarts, valrhona chocolate, vanilla, vanilla heaven. 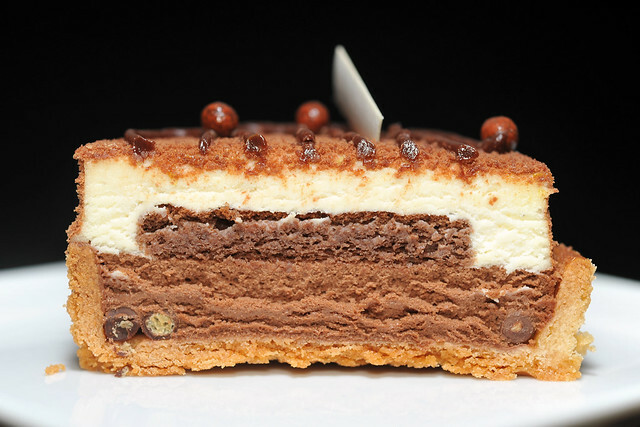 Your close-up and cross section shots are very appetizing! 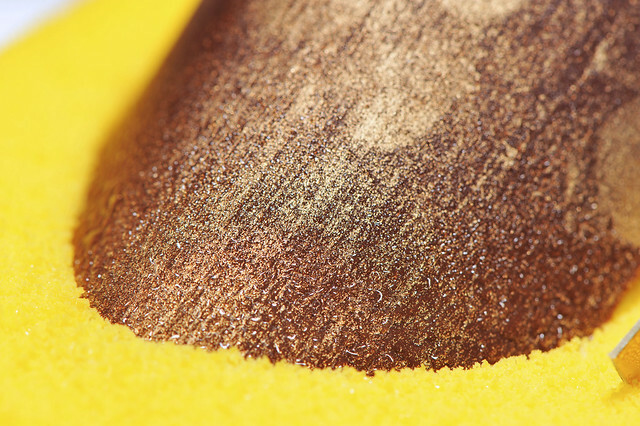 Mango has a strong taste and pairs well in baking if used correctly. I’m not surprised that the Mango Madness is not good, the jello must be made of ugly gelatine with weak mango extracts instead of real mango juice concentrate. you sounded quite disappointed with them! fingerprints?! haha! you should brought it back and ask them! maybe it’s a kind of decor too, LOL! haha not disappointed la. Just thought that they could do a much better job with the decor and the tarts themselves! Alan, Just pop by to see how you doing. Hope all is well. Gong Xi Fa Cai in advance! 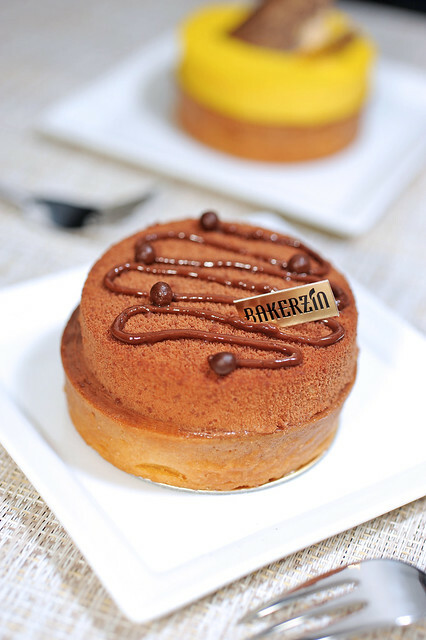 I don’t understand why bakerzin has to keep copying PH’s creations. Integrity aside, they can never nail any of the combinations simply because they are simply using inferior ingredients- and they don’t have the techniques PH has of course. However their original creations on the other hand, esp those desserts for dine-in like their cheesecake ice cream, or mille feuille are delicious. 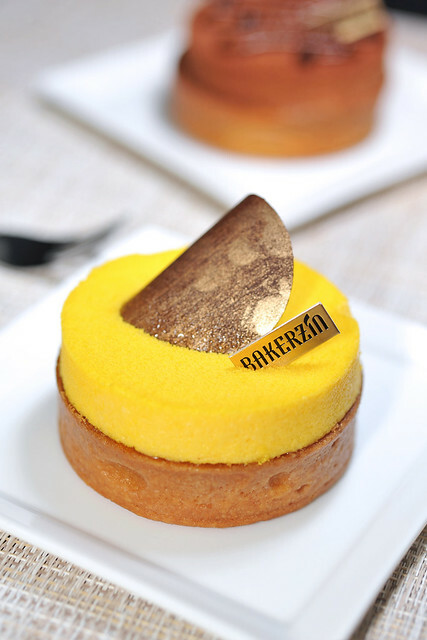 Hi Rachel, if my memory serves me well, Chef Daniel Tay of Bakerzin apprenticed under Pierre Herme before. Perhaps that’s why the works of the French master are so ingrained into him. Not sure if they used inferior ingredients but I do agree that the standards are somewhat falling short and inconsistent, e.g. tart shells with soggy bottoms. 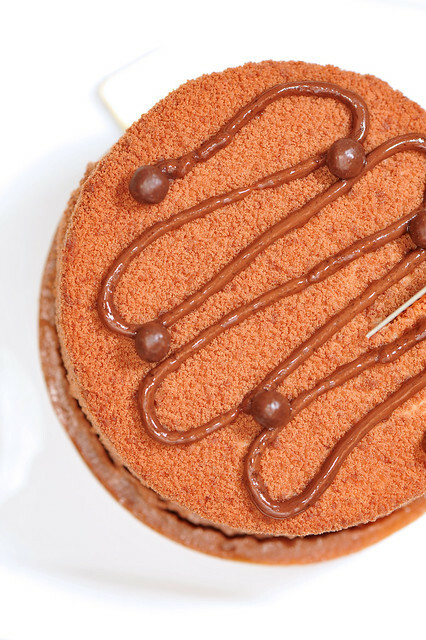 Like you, we like thir plated desserts, especially creme brulee and the gargantuan profiterole with vanilla ice-cream. The latter is simply yumz all the way! Gosh, I realise I made a lot of grammatical errors in my previous comment. sorry about that. Was probably distracted by something haha. No worries about the grammar errors. I make tonnes of them too! Alongside freudian slips and spelling mistakes! I miss Japan already! looking forward to visit again later this year or next year. But it would probably be a patissierie hopping trip! Getting ready for the sugar rush! Which places do you plan to visit? I’m planning to go tokyo, and hopefully up north to hokkaido. I’ve been to Hokkaido before but not during the spring season. And tokyo’s a place that I can visit and revisit all my life haha. Ah yes! Sugino is definitely top on the list of places to visit! I’d tried to recreate some of the recipes from his book and they were delish! Simply can’t wait to try the real thing! 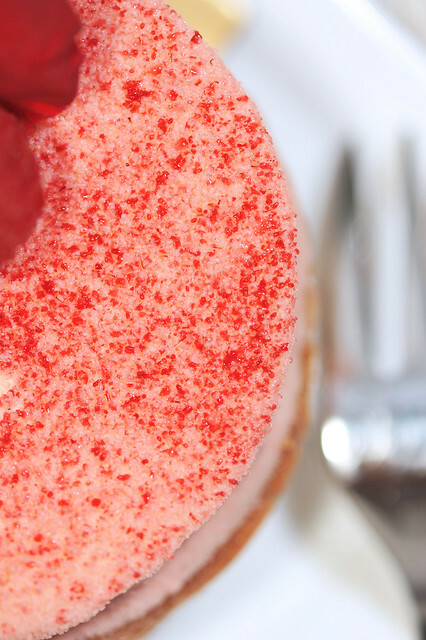 Other places top on my list would be LaDuree and Pierre Herme’s dessert boutiques. Tokyo is probably the closest we can get to pastry heaven, since France is so much further away. Backpacking from Tokyo to Hokkaido is gonna be quite a feat! Especially when you have to travel through the Tohoku region which was most badly hit by the Fukushima tragedy last year. We were very lucky to have escaped the catastrophe having returned from Japan two days just before the earthquake and tsunami occurred. Had plans to return to Japan this year but we’d decided to shelf this till next year, when we are more confident of the situation in Japan. But yes, I totally get your feel of Tokyo. Never boring, ever exciting!